Biochemist Barry Sears created the Zone diet based on his theory that eating a certain ratio of macronutrients at each meal limits inflammation, controls blood sugar, and results in a healthier weight. This diet may also help you get enough of vitamins A, C, E and K without increasing your risk for any micronutrient deficiencies, according to a study published in "The American Journal of Clinical Nutrition" in August 2010. You'll have to do a lot of math to follow this diet, however, as it requires that you get a specific ratio of macronutrients at each meal. A Zone diet meal plan consists of three meals and two snacks, each containing 30 percent fat, 30 percent protein and 40 percent carbohydrates. Women typically eat about 1,200 calories per day, and men eat about 1,500 calories per day when following this diet. Your first meal should be within an hour of waking up, and you eat your remaining meals and snacks at five-hour intervals throughout the day to help minimize hunger. Most of your carbohydrates should be low on the glycemic index, which includes most fruits and vegetables, since this diet aims to control insulin levels; the majority of your fat should be monounsaturated instead of saturated. Limit egg yolks, red meat and processed foods and choose omega-3 fat-rich fish, almonds, avocados and olive oil for your sources of fat. The exact amount you eat at each meal depends on your gender and size, since larger individuals need more calories than smaller individuals. A sample Zone breakfast for a medium-sized woman would be 2 eggs or 4 egg whites mixed with an ounce of cheddar cheese and 1 1/4 cups of broccoli cooked in a teaspoon of olive oil, 2/3 cup of raspberries and 1/4 of a cantaloupe. A medium-sized man would need a larger amount of food, so he might add 2 ounces of Canadian bacon and 1/2 an English muffin topped with a teaspoon of peanut butter to the meal. 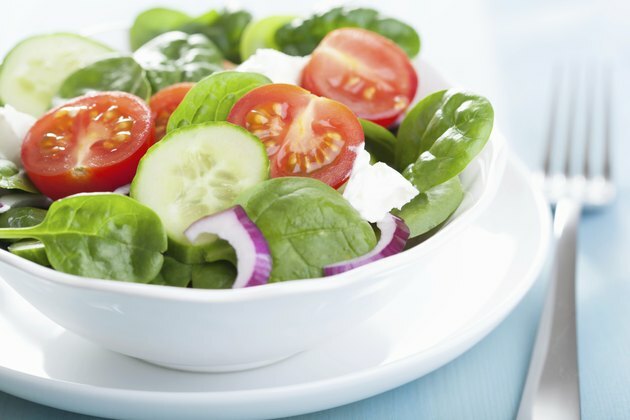 Lunch for a medium-sized woman could be a salad made with 4 cups of spinach, 1/4 cup of kidney beans, a cup of tomatoes, 2 ounces of chicken breast, 1 1/2 ounces of feta cheese and a tablespoon of salad dressing. A medium-sized man could add a cup of milk, about 12 peanuts and an apple to bring the meal's calories up to the right level while still maintaining the right proportion of carbohydrates, fats and proteins. Dinner on the Zone diet plan for a medium-sized woman might comprise 3 ounces of salmon, a cup of green beans topped with 1 teaspoon of melted butter, 1 cup of strawberries and 1 cup of milk. A man could add an additional 1 1/2 ounces of salmon, 1/3 cup of boiled or mashed potato and a teaspoon of sour cream while still staying within the Zone diet guidelines. Your two snacks should be relatively small compared to meals, and are about the same for a medium-sized man or woman. A snack could be a 1/4 cup of cottage cheese mixed with 1/2 cup of pineapple and topped with 1/4-teaspoon sunflower seeds, or 3 cashews, a peach and a 1-ounce piece of string cheese.